Wimpy Bars were fantastic. Supposedly they still exist but you hardly see them anymore. When I was a kid, by comparison, you only saw them and hardly ever a McDonalds. Quite often when I was growing up my dad would take me up to London (we lived half an hour’s train ride from Waterloo), sometimes to visit museums, parks, exhibitions or the cinema but often simply to walk around the city, and invariably we would end up in a Wimpy at some point for a cup of tea. Usually I would want tea and my dad a hot chocolate; he was rather particular about his tea, I think, and although I never knew him to drink hot chocolate at any other time, he would order it at places like Wimpy because it was “the only thing they can’t screw up”. I didn’t know what he meant; the tea tasted OK to me. Wimpy Bars were like modern burger bars with one massive difference: you sat down and a waitress came and took your order and brought it to you. This happens so rarely in cafes now that whenever I’m in one I instinctively go up to the counter to place my order, expecting it to be self-service like we’ve become used to, and when they say “Take a seat, I’ll bring it over” I instantly fall in love with the place. Anyway, in my recollection the Wimpy waitress (not being sexist here, it was invariably a woman) would then bring the tea and hot chocolate over and give me the hot chocolate and my dad the tea, the logical assumption. My dad would then chuckle and say it was the other way round. I have a particularly happy memory of this happening when we were sitting in the Wimpy outside Waterloo station one Sunday afternoon after one of our wanders, watching the traffic. I’m pretty sure the tables (and possibly also the chairs) were fixed to the floor, and the table tops were covered in a hard-wearing vinyl of a small check pattern. We would talk about everything, although I can’t remember any of the conversations now. I especially liked the squeezy ketchup bottles which I think were embossed with a Wimpy motif. Mr Wimpy was the mascot of the burger chain. Dressed like a London beefeater, his eyes were hidden under his hat and his mouth was mostly hidden under his ruff, only his gigantic nose showing. Looking him up now on Wikipedia reminds me he was drafted into service as a video game character in the 1980s, but I don’t remember this happening and frankly don’t approve of it. 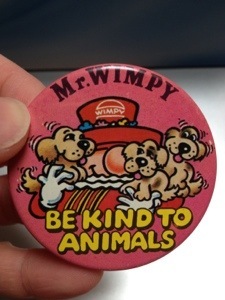 I also don’t remember the particular campaign featured on the badge, or any such campaigns really, but it seems a sensible one and no doubt popular with kids (I had lots of pets and was a member of the RSPCA). Of course, Mr Wimpy could have been really kind to animals by not serving them up in his cafes, but… burgers. Yum.